If you don’t know what a holeshot is, it is the rider with the strongest start off the line, a term most commonly used in the dirt riding world. 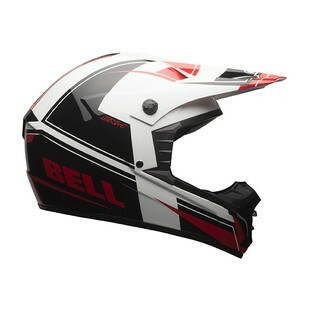 Using that definition, I consider the new Bell SX-1 Holeshot Helmet to be more appropriately named than they may have even realized themselves. If you’re anything like me, starting out riding dirt can be an intimidating foray into unfamiliar territory. Faced with having to purchase an entire new arsenal of gear, you might be working on a budget and just want to get started as soon as possible to see if it is for you. You follow where I’m going with this? Getting off the line as soon as possible. Personally, I think that exact need is what the SX-1 Holeshot aims to satisfy. This is an entry-level dirt helmet coming in below $100, aimed at value-conscious off-road riders who want a helmet they can trust without breaking the bank. Designed with six sizes, three EPS liners, and one shell size, the SX-1 Holeshot meets both DOT and ECE standards in a lightweight polycarbonate shell. Designed by the folks responsible for producing some of the most technical and advanced professional motocross gear on the market, you’ll feel confident hitting the trails in this helmet, backed by a five-year warranty, all for a price won’t sting too bad if you decide to stick to the pavement. We need more helmets like this.